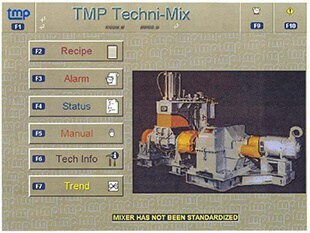 The Techni-Mix Mixer Control System is designed to operate any intensive mixer used for rubber or silicone compounding. The system provides an advanced means of developing, analyzing and storing compound mixing procedures. It provides for documentation of the various process parameters for each mixing sequence, documentation of changes made to the mixing procedure by the operator, and production history and analysis. 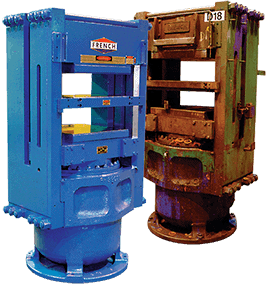 Packages are available for both Tilt and drop door style mixers as well as for incorporating upstream ingredient weigh stations or downstream mill and take-away processes. Contact us for more information about our Techni-Mix Advanced Controls for intensive mixers. Graphic displays showing Recipes, Machine Status, Faults, Calibrations, etc. 5) Push buttons, for safeties, manual operation, etc. Trending/ Graphics screen of Power (KW), Energy, and Batch Temperature.